Anyone who works in business or employs people for any reason will know how important it is to accurately keep track of the hours of everyone who works for you. It’s vital for the payment of salaries, and company records to have good and accurate timesheets. For any employee, using a good biweekly timesheet template is a great way to keep track of your employees’ hours as well as payment of salaries. Keeping track of the hours and salaries of your employees biweekly can make the job of any employer easier. The biweekly timesheet template is easy to use and free to download so your job as an employer will be made easier at the click of your mouse. The template can be used in Microsoft Excel and is fully customizable to suit the needs of any company or employer. In the biweekly timesheet template free, there is a selection of headings to help you divide up the necessary information about the hours your employees do as well salary information. The biweekly timesheet template Excel has a section in which you can input the name of your company, as well as all relevant information about it. 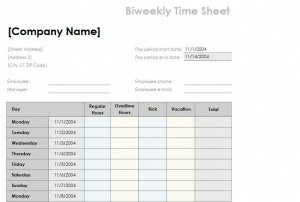 You can add the dates of the pay period, as well as the address of your company. Additionally, you can add the manager and employee name. Under this, the biweekly timesheet template free is divided into columns entitled: day, regular hours, overtime hours, sick, vacation, and total. Under this, the template allows you to input each day that your employee will be working. You will then be able to enter the hours your employee works under each relevant heading. At the bottom of the biweekly timesheet template Excel, there is a section in which you can enter the total hours worked, the rate per hour, and the total pay of the employee. If you are going to give a timesheet to each of your employees to fill out manually, make sure you have enough timesheets printed. Make sure to accurately enter all the information about hours and pay. This will make your job easier when payday comes around. Make sure to keep up to date with your timesheets. Entering your information on a daily basis will mean for better accuracy and you will be less likely to forget any details.